What is an ads.txt file and do you need one? You can create an ads.txt file in any text editor (Notepad, BBedit, TextEdit, WinEdt, etc). If you feel like you can only use MS Word for some reason, be sure to save the file as a TXT file otherwise it will not work. If you open the ads.txt file in your browser and you see anything else except the text you typed into it or it tries to open in an application like Word, then you did something wrong. In the links at the start of this article, you will find details about what to put in your ads.txt file. Sometimes, your ad service provider or network will provide you with a pre-populated file. It should look something like this the following. After you have created or received the file, be certain that it is named ads.txt. Next you are going to upload it to your website. The official instructions for managing your ads.txt file say that you would place your ads.txt file at the "root" of your website. This means that it should sit at https://www.mydomain.com/ads.txt. On the ePublishing system, the "root" is restricted for developer use only. The instructions below describe how to create a redirect so that the bots looking for your ads.txt file can find the ads.txt file even though it will be uploaded elsewhere (which is allowed according to the IAB specifications). See the big note at the bottom of this KB article for what to do if an ad agency or third party cannot read your ads.txt file without it physically sitting at the "root" of your website. Once you have them open, go to the media manager (Editorial >> Media >> Manage Media Files). Upload the ads.txt as a "General" file type. There is no need to give it a name or place it inside a folder but if that makes feel giddy with power, go for it. Once it uploads and you see it in the media manager's edit window, copy the "Web URL". It's probably something like /ext/resources/ads.txt. If you make a change to the ads.txt file, you will need to use the "Replace it with" button in the Media Manager (check out the screenshot above). You will need to completely replace the currently-saved file with your new one. 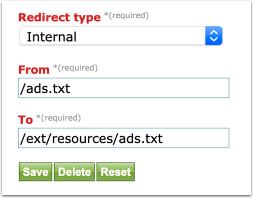 Open the redirect manager in the admin tools (Editorial >> Redirect >> Create). Leave the redirect type as "Internal". The "To" and "From" should look like the image below. If you stuck the original ads.txt file in a folder be sure that the path includes the folder. 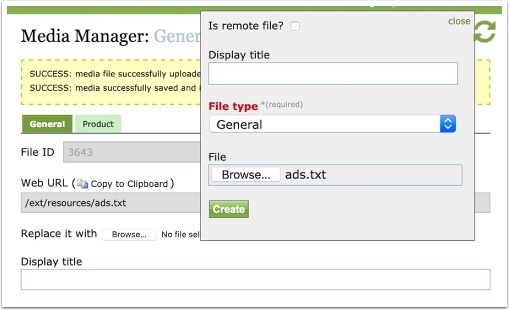 The example shows ads.txt sitting to the top level of the media manager – not within a folder. Click "Save" and you are ready to test. Give your site a few moments to clear its cache. If you know how to clear cache, then flex your muscles, but waiting works too. Go to https://www.yourdomain.com/ads.txt and you should see the content of your ads.txt file show up in your browser window. The URL will update to match the "To" URL you entered in the redirect manager. If it doesn't, wait a little longer for your cache to clear. This will work, trust me. What if an advertiser says the redirect is throwing off their bot? First, you could try telling the ad network or advertising rep that the script they are using to read your ads.txt isn’t following the rules laid out in IAB Tech Lab Ads.txt Specification. If they don’t feel like following the rules and you still want to work with them, contact your Project Manager (or Solutions Manager) and tell them that you tried the redirect solution for ads.txt but you will need ads.txt placed directly into the root of the website to solve a problem. Next: How can I control my 404 or Page Not Found page?